The condition of roads is now motorists’ top concern as nearly four in five rate them as poor, according to a major study of drivers’ attitudes. According to the RAC’s Report on Motoring 2018, the state of local roads – in particular, road surface quality and potholes – has become the most frequently cited gripe among Britain’s motorists. In this year’s survey, 42% of motorists said the condition and maintenance of local roads is one of their four main concerns, compared to 33% in 2017, with one in six (17%) saying it is their main concern. In addition, 78% of motorists rated the state of both local and strategic roads as ‘generally poor’, with two thirds (66%) saying the condition of their local roads has deteriorated in the past year, and two in five (40%) saying the same of major roads. More than four in five drivers (83%) said they wanted to see a proportion of the motoring taxes they pay ring-fenced to fund maintenance of local roads. The second most common concern was drivers’ use of handheld mobile phones, with 38% citing it as a concern, down slightly on 40% last year. 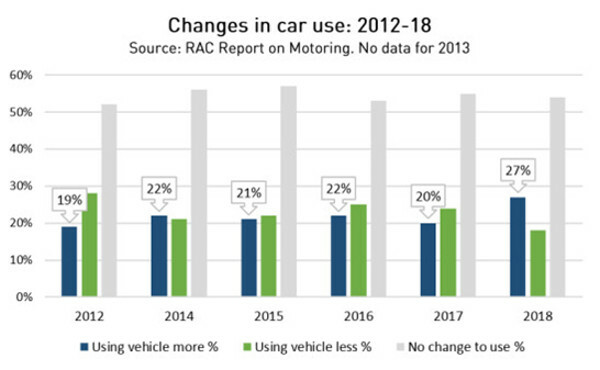 In 2018, 27% of motorists said they are using their cars more than last year, with only 18% saying their use has reduced. This follows three years where drivers on the whole reported using their car less. Similarly, a third (33%) of drivers said they are more dependent on their car now than a year ago, compared with 27% who said this in 2017. Of those who are driving more, 24% blamed a deterioration in public transport services. While only 12% of drivers cited the environmental impact of motoring as a top four concern, 44% said they are more concerned than a year ago about the impact of vehicles on local air quality – up 4% since 2017. More than half of respondents (52%) said the Government is unfairly targeting diesel drivers as a key source of air pollution while a similar number (47%) said they are unsure whether new diesel vehicles are bad for the environment.